If you’re looking to organise a romantic or special sailing experience, we recommend you rent a gulet to explore Ibiza and Formentera. Gulets are originally from Turkey and are made of solid wood. Gulets normally have two masts and a powerful engine which make them large motor gliders. They offer spacious cabins with private bathrooms, and large dining rooms for group meals. Their large size, 20 to 35 m length, means there’s plenty of outdoor space to enjoy sunbathing. Tirandil is a special gulet model which has only one mast and a hull with smooth water lines allowing you to sail better than a classical gulet would. 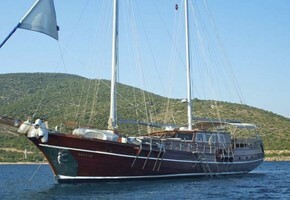 Gulet charter in Ibiza and Formentera always includes skipper and cook.